Which version of Huey, Dewey and Louie u prefer? de keuze van de fan: The rather typical kids; not too mature & nice, but not as bratty as originally. Do u imagine his voice quacky and unclear when reading the comics? Who do u like better as the voice of Donald? de keuze van de fan: Can't tell the difference! Can&# 39; t tell the difference! What is your fav Donald eend short? A Disney Tale: Jiminy Cricket introduces two tales - Bongo the beer (a slightly disturbing tale of love in the beer community) and Mickey and the Beanstalk (a Disney version of the well-known fairytale). For meer details on this topic, see Donald eend filmography. Hi Do u Love Cartoon Characters ? Wont a Nice Club There Are Nice videos And Picture ..... ? There Are a Lot Of Characters Like : Hello Kitty - Cenderella - Betty boop - Tweety - Sponge Bob - Tinker klok, bell - Lulu Caty - Mikey muis - Winnie The Pooh - Carz - Sanrio Characters And meer !!!!! Hurry Up u Will Be The - u Will Be 11 fans - Hurry Up ! Which Donald Duck's cartoon ? Coolest Donald item u have? 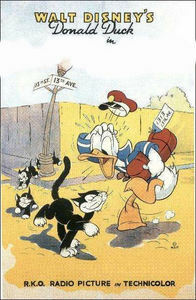 Donald Duck: Roll-Model of Menace?